In a game filled with excellent catchers, the one who stood out was the unlikeliest of all. 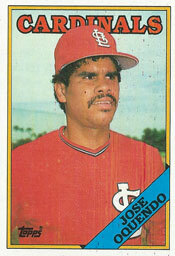 In 1988, Jose Oquendo caught an inning for the Cardinals in a game against the Mets at St. Louis. In doing so, Oquendo became the first National League player in 70 years to play all nine positions in one season. Before Oquendo, the last to accomplish the feat in the National League was Gene Paulette, primarily a first baseman for the 1918 Cardinals. Cesar Tovar of the American League Twins played all nine positions in 1968. On Sept. 24, 1988, the Mets jumped to a 6-0 lead in the second inning against the Cardinals. Oquendo, 25, started the game at his primary position at second base and moved to shortstop in the sixth inning, replacing Ozzie Smith. With the Mets ahead, 10-1, Cardinals manager Whitey Herzog, looking to give the home crowd something to cheer, decided the time was right to play Oquendo at catcher. In the seventh, Oquendo moved from shortstop to catcher, replacing starter Tony Pena, the National League leader among catchers in fielding percentage in 1988. First up for New York with Oquendo behind the plate was Gary Carter, the Mets’ 1988 all-star catcher. “I told (Carter), ‘Don’t foul it off. I don’t want to get hit,’ ” Oquendo said to the St. Louis Post-Dispatch. Facing reliever Steve Peters, Carter obliged, flying out. Tim Teufel was the next batter. With the count 3-and-1, Peters shook off Oquendo’s sign. Before he could offer another, Peters went into his wind. On the next pitch, a 3-and-2 curve called by Oquendo, Teufel swung and missed, striking out. Kevin Elster then lined out to third. It was the only one of the nine innings the Mets were retired in order. His goal accomplished, Herzog lifted Oquendo and replaced him with catcher Tom Pagnozzi in the eighth. In 1988, Oquendo appeared in 69 games at second base, 47 at third base, 17 at shortstop, 16 at first base, nine in right field, four in center field, two in left field, one at catcher and one as a pitcher.